I've got an almost 100 year old rifle, M1917 Eddystone barrel dated 4-18 and serial #is in that month. It was rearsenaled during WW2 at Odgen Arsenal and put in cosmoline. The rifle was prestine then and nothing appears to have been done to it other than inspection and cosmoline. It really looks like it's never been issued. I've had it about 20 years and it's still in the grease. My question is do I want to clean it up and shoot it with cast or should I just leave it in the grease and hand it down to posterity? It's not like I don't have other 30-06s to shoot. So what do I do? Appreciate any responses. If this was a collector forum you would mostly get collector answers. Since this is a shooting forum, you're going to get mostly shooter answers,,,,,. Personally, it makes me a little ill when firearms never see the light of day. It's Easter, time for it to be resurrected. I have 4 Winchesters and regularly shoot them with cast boolits without destroying their collector value! 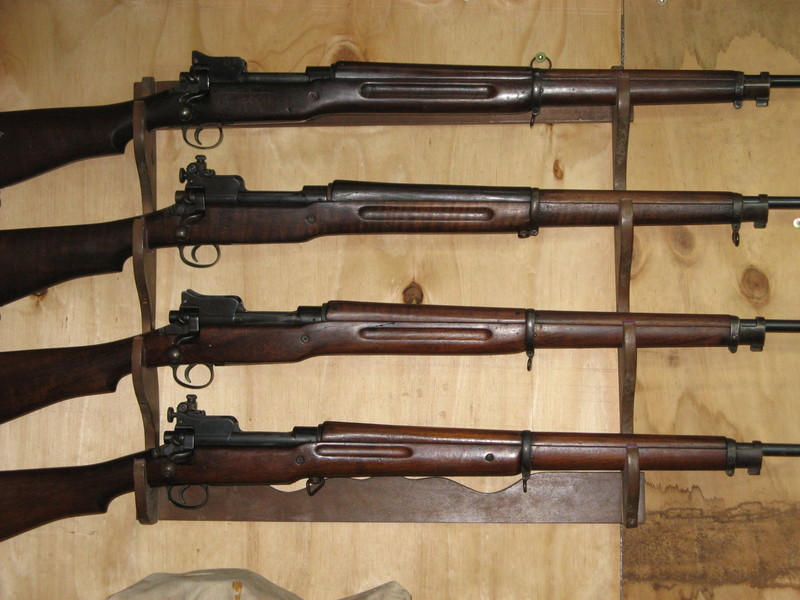 Beautiful rifles, can you tell us about the two rear sights, I've never seen one like them before. Also, is the bottom stock a P-14? Other than being a tad heavy (~10 pounds) for my tired bones to carry, there's not anything else I can say not-good about the rifle you have! If it were mine, I'd spend the time and clean it up! To remove the Cosmoline is often not a quick and easy operation, sometimes requiring multiple applications of solvent complemented with arduous wearing out of both brass and nylon brushes! That said, you may wish to identify the parts complement in your rifle. Albeit you note it as "pristine", it is indeed rare that, say, a Remington is ALL Remington; a Winchester ALL Win, etc. The armorers at Ogden, I'd surely venture, had the integrity of the parts they replaced as their #1 priority; WHO manufactured them as their lowest. I have four 1917s, and all came with mixed parts. 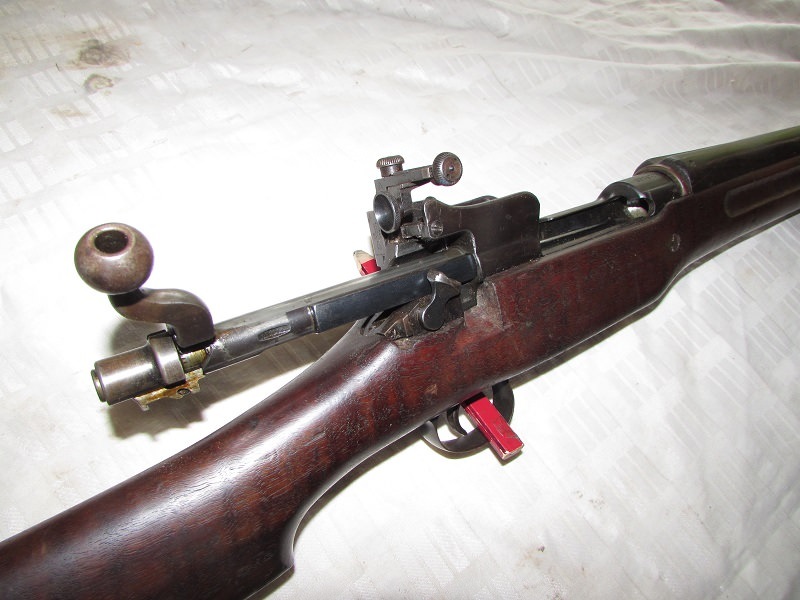 A couple of gents -- http://oldguns.net/catacc.htm -- offer a service where you may swap out almost all 1917 parts to enable you to make yours 100% (or close ) to any one manufacture, if you wish to do that! If it were mine -- I'd clean it up. De-cosmoline it. If there are parts you wish to swap, get in contact with John &/or Mark to swap as needed. Take it to a reputable gunsmith to ascertain it being safe to shoot. And... take it to range! Vis "handing it down..", I'd think, too, it be worth more to an heir that both YOU restored and fired it; PLUS, handing down a gorgeous, accurate, shootable firearm! The 1917s action was/is so good, it became the base for many sporterized custom rifles through the years -- you indeed have a prize to be cherished! Low heat is one of the best ways to remove cosmoline. I built a box lined with tin foil with a couple of light bulbs inside. A bar across the top allowed the disassembled rifle to hang and a drip pan in the bottom caught the drippings. No chemicals or scraping needed. Wipe down the parts with a little mineral spirits when through. There are a mix of M17 and P14. The rear sights are Parker-Hale 5B which fit neatly between the action ears. They have 1/2 minute clicks. They shoot cast boolits very well. Cleaning up that old girl would be a labor of love. Get after it and let it roar again. I'm jealous to tell the truth. clean it up and shoot it. so long as you dont abuse it and take care of it, shooting it wont hurt its value. Why pass life by, so someone else can enjoy it? Clean it up, and enjoy it. Take a photograph of it as is, then clean it up and shoot it! True cosmoline has a wax-like consistency after drying, but automotive type grease would probably be similar to cosmoline after drying long enough. If it's still a bit greasy it can be cleaned off of the metal parts with kerosene or mineral spirits. Put the small pieces in a pan and put them outside to soak. Kroil is good to clean the bore if you have any; if not, the above will do until you get the bulk of the grease out. Clean grease from the wood with mineral spirits and patience, and ignore suggestions to put the stock in the dishwasher or use oven cleaner to degrease it. Neither are designed for use on wood, but mineral spirits will do no harm. The greatest value you can get from a nice rifle is to carefully use it until it is worn out. No cash value can ever match the satisfaction of long use. I used to clean them with a can of gasoline and a parts brush. All steel parts in the bucket, lean the stock up against the metal shop in full summer sun and keep wiping away the cosmo as it bleeds out of the wood. Good times! When I was a kid,I bought a M17 E solid with cosmoline for $12.....all the money I had.I dug it out with ice cream sticks.....and got the sticky waxy goo everywhere.Any time the gun was out in the sun,the stock would sweat liquid oil,and be so slippery you could not hold it without wiping down..........but a couple of years later ,I went to work ,and the surplus barrelled actions were put through a tri chlor ethane bath,the cosmoline simply disappeared,and was left in the sump of the machine . I would degrease the rifle thoroughly & shoot, shoot, shoot it. = GREAT rifle for shooting most any game in the Western Hemisphere from a tower blind, inasmuch as it IS heavy to tote when stalking. 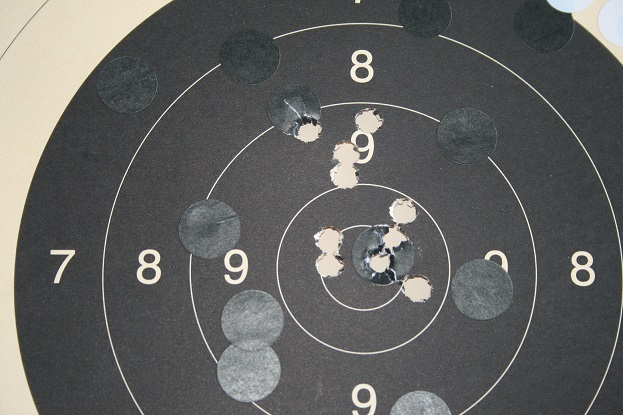 Every 1917 that I've ever shot did fine out to 300+M with M2 ball or an equivalent handload. The BEST way that I've discovered to degrease an oil/grease soaked stock is sealing it up in a BLACK plastic trash bag with kitty little & putting it out in the direct sunlight for a HOT Texas day. = Let EL SOL do the hard job & then disassemble & complete the job with mineral spirits & a stack of cotton rags. If it were mine I'd have been shooting with it since I first got it. For those who still have doubts about this sort of thing I suggest that they first offer it for sale as is and if no one offers far more than its really worth simply because its in the wrap then clean it up and have at it. If they are willing to pay double what it would cost for a cleaned up example then buy two good rifles with low mileage. Mummy wrapped No.4s were going for ridiculous prices a few years back. In some cases old Cosmoline can shrink away from metal as it ages leaving an air space where moist air can condense in the cold and rust the steel with no one the wiser till the cosmo is removed.